Darwin defined the rules of the game as survival of the fittest, but within that paradigm there seem to be limitless possible variations and mutations that can win out. That’s what makes the planet such a diverse and wonderful place, full of giant flightless birds, lemurs which bulging eye, coral reefs teeming with life, and hairless primates that somehow rule the world. But evolution isn’t always so unpredictable. A study released today in Current Biology shows how Hawaiian stick spiders of the Ariamnes genus demonstrate the same evolutionary pattern time and again. On each of the Hawaiian islands, the spiders have followed the same evolutionary path, branching into brown, gold and white variations that serve as camouflage and keep them safe against predatory birds. Most remarkable of all is the fact that the spiders on each island are more related to other same-island spiders of a different color than they are to same-color spiders on different islands. A brown spider that jumps from an old island to a new one can diversify into new species of dark, gold, and white spiders in about half a million years. This pattern of island hopping followed by evolution repeated itself across the entire archipelago. Notably, while repeated evolution is extremely rare, this isn’t the first time it’s been discovered. 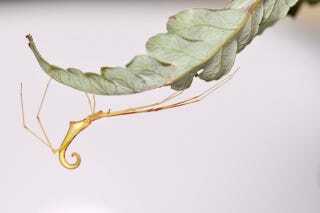 Other examples include the Hawaiian branch of the Tetragnatha genus of long-jawed spiders, and the Anolis lizards of the Caribbean. One of the goals of Gillespie’s paper is to pinpoint where and why this happens, to define the commonalities between systems where you find this rare evolutionary cocktail. Gillespie explained that the recipe seems to include a need and ability to camouflage, as well as a limited number of predators from which to hide. It goes without saying that this delicate evolutionary dance is being flipped upside down by human action. As new creatures are introduced and habitats disrupted, the tactics that lead spiders (and millions of other creatures) to thrive in their surroundings will no longer ensure their survival. So far, the Hawaiian stick spiders are safe, largely because they live on remote islands far from human development; but it’s only a matter of time until their habitats become disrupted as well.